Deliveries are another great opportunity to get offshore experience as crew but they’re harder to find and require more vetting than other types of offshore opportunities. They are tougher to find than paid offshore courses and voyages that maintain a web presence to keep business coming in. In addition to finding and selecting an opportunity you need to convince the skipper that you’d be an asset to the trip. Deliveries usually require solo watches. You must also evaluate the safety of the passage for yourself which can be very challenging via the internet. Still, if you’re up for the added challenge these trips present they are a great, inexpensive way to get offshore. I suggest looking at a few actual opportunities before making that decision. Let’s start at the beginning. CruisersForum.com: This forum is used by skippers looking for crew and crew looking for skippers. There are restrictions on private message replies when you first sign up; you can jump right in but are slightly restricted. This is the only free option any of my sailing friends strongly recommended. FindACrew.net: A free purpose built “find a boat/find a crew” site that has a free membership. The quality of the listings varies greatly and you have to rely on other free members not contacting you with “romantic” inquiries; you’ll have to sift through a lot of chaff to get to the wheat. All that said I’ve had friends find awesome offshore opportunities using FindACrew. CrewBay.com: Similar to FindACrew but with a bit more focus on what the boat owners are up to and looking for. You still have to sift through a lot of irrelevant posts to find good offshore opportunities. 7Knots.com: a very simple and to the point crew-to-boat message board. Not too active but someone posts an opportunity every week or two. Yacht Delivery Crews Network: A Facebook Group version of the Crew Wanted/Available forums. I’ve seen some great opportunities pass by here and it’s easier to keep up with if you’re on facebook regularly. Sailboat Hitchhikers and Crew Connections: A 4 month old but quickly growing Facebook group that has plenty of offshore opportunities mixed in with longer term cruising opportunities. Sailboat Crewfinder Worldwide: Finding crew on facebook is currently trending. This is another group with good opportunities that you can keep up with facebook; a bit more of a longer term cruising tendency that the others. $10 – OceanCrewLink.com: Started by the World Cruising Club to help yachts participating in their rallies find crew. Similar to FindACrew but with an emphasis on offshore passages (as opposed to any sailing engagement). That $10 charge does a lot to improve the quality of posts, skippers and crew that participate. £20 – Halcyon Yacht Delivery: Looking for more experienced crew. You can’t browse their opportunities; you just submit your information and then they reach out to you. Or you can try their facebook page where you can browse some opportunities. £25 – The Cruising Association: A membership site where, once you register, you can see the list of skippers looking for crew. Seems similar to OceanCrewLink and FindACrew once you’ve paid your dues. £70 – CrewSeekers.net: Listings from “Enthusiasm is the most valued attribute” to multi-year professional captain positions. Still, the focus here is more on professional crew looking for jobs than on novice crew trying to get offshore experience. But I’ve had a friend who really enjoyed the passage he found on this site. £105 – Ocean Cruising Club: Their mentorship program is an interesting proposition for sailors looking to learn offshore. But their website doesn’t list that many opportunities and it costs £105 with some hoop jumping before you can respond those opportunities. $199 – SailOPO.com: Curated list of Offshore Passage Opportunities. Somebody reviews each sailing opportunity and they refuse to post opportunities they deem unsafe. Sailing friends who used SailOPO.com strongly recommend it. Had enough? Me too. If you find all these opportunities overwhelming here’s my prescription: I spent the $10 and signed up for OceanCrewLink.com; I browse this once a week along with CruisersForum.com because these two seem to have the highest volume of opportunities that interest me. I also subscribed to Yacht Delivery Crews Network, Offshore Delivery Crew, Sailboat Crewfinder Worldwide and Sailboat Hitchhikers and Crew Connections on facebook; this way I get to watch some quality opportunities go by in my feed on a site that I normally keep up with. Subscribed to all four facebook groups there are a fair amount of duplicates but you can prune as you decide on your favorite. If you’re willing to part with $200, SailOPO.com is reputed to be the “easy button” for finding a ride offshore; good, cheap opportunities delivered to your inbox regularly. $200 seems like a drop in the bucket compared to some other ways to get offshore experience but it is the most expensive option for finding skippers to sail with. I haven’t signed up because, fortunately, my dance card is pretty full for 2017. It’s almost always up to you, as crew, to make initial contact with the skipper. It is important to remember that they are evaluating you as soon as you reach out. Be friendly. Be upfront, especially about your sailing experience! Often skippers will choose an enthusiastic novice over a seasoned offshore sailor. Before you decide how to reach out let’s consider what skippers are looking for in crew. The next thing a skipper is evaluating is your experience. If you’re new to offshore the skipper probably isn’t expecting much; you’re probably just an extra pair of hands. If you’re a novice your skipper wants to know you are familiar enough with offshore safety equipment to keep yourself safe. They will also want to know if you have enough experience in rough weather to know how to manage your own experience. If you’ve got some experience lead with your most relevant strength. Diesel mechanic? Paramedic? Licensure for the sailing area? Circumnavigator? Lead with that and then throw in your sailing resume later. If you’re comfortable standing a solo night watch definitely include that info. Skippers are looking for committed and compatible crew. Are you willing to buy your own flight? Purchase the safety gear required? Get to the boat a bit early? Compatibility is tough to judge before you sail together. There are the usual social sticking points: Non-smoker? Drug-free? Low Booze? No Booze? Dietary restrictions? These things matter when you’re sharing a small bobbing house with several sleep deprived people. Be upfront​ about all this to decrease your chances of a miserable passage. It’s tough to make generalizations about what you need to put in your first contact with a skipper. Instead I’m going to give you a few guidelines and then copy in the exact message I started with that ended up with me getting onboard. Lead with your strongest qualification. In 2015 I was “enthusiastic”. In 2016 I was “experienced”. This year I’m “a veteran”. If the skipper provided a bunch of information in the post demonstrate that you read what they wrote. Look up the boat on SailBoatData.com or check the forecast if it’s a short notice posting. Ask a question about the travel requirements in a way that demonstrates you researched the answer. Segue into a safety question. RESPOND TO THEIR EMAILS in a timely manner. If you don’t, apologize. If you’re too busy to send a complete response send a quick note to let the skipper know when you’ll follow up. If they know they’re going to hear from you they’re less likely to go looking for other crew. People who don’t respond to my emails promptly get eased off the list. If you have a sailing resume make it so the skipper need only click to start reading it. Consider writing a sailing resume if you don’t have one. Hello Skipper Name, nice to (digitally) meet you. I’ve been watching the forecasts with some friends with boats in Buzzards bay and they’re confident enough that Joaquin is going to miss us that they’re not planning on moving their boats. I saw the data you sent along and that seems to agree. Second question: could I get dropped off at BWI on the way back? Depending on how you go it’s right on the way. The aim would be for me to book a last minute flight back to Boston (which can be had for $132 right now) and be back that much sooner. I might not do it but if it would get me back in the office a day earlier I’d probably have to. Last question: when would you like us at the boat on Saturday? I let getting copied on the thread stand as an indicator of suitable experience and responsibility for the passage and proceeded to reinforce that. The opening was due to weather so I jumped right in. I snuck in a communication safety gear question. This was my 3rd offshore trip so I knew about PassageWeather.com and clicked around to assess the situation and shared what I found. 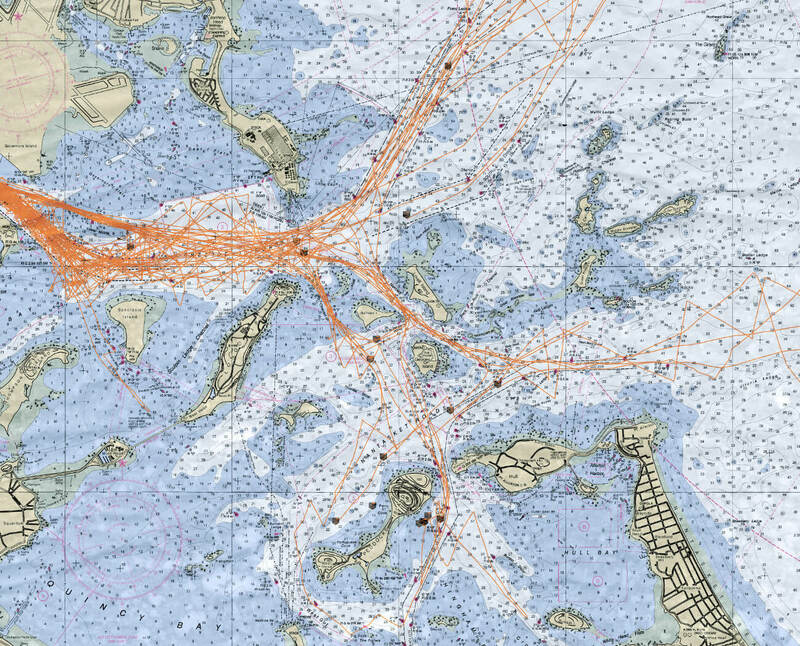 (The following year I was doing the routing for the same boat and skipper using apps on my smartphone.). The rest was all about demonstrating commitment to the passage by showing that I had considered the logistics. It was a great passage! Congratulations on boatname’s passage south to Bermuda! I’d love to join you aboard boatname for the trip south from Bermuda. I’ve sailed from New England to Bermuda twice but have always turned around and headed back north afterward; I’d love to keep going south to paradise! My sailing resume is here: http://savvysalt.com/sailing-resume/ but it’s a bit out of date; I’ve doubled my offshore miles during the 2016 season. When were you planning on leaving? I have to figure out scheduling/timing with work but I’d love to join you. I checked the boat’s blog and knew they had just done the passage south to Bermuda so we had that in common. They were excited about the passage and I was too so I let that shine through. Once again, getting specific about dates means I’m serious about the passage and not just daydreaming on the forum. I got offered the spot (they even offered to pay for my flights) but I couldn’t make the dates work. Once the skipper has responded to your initial message everything is simpler. Now instead of guessing what will prompt them to respond to your message over other messages they’ve received you can simply answer the questions they ask. I suggest straightforwardness rather than strategy here; once you’re in the running being forthcoming in answering their questions will decrease the chances of a miserable passage. Besides, once you’re in the running you have another job to do: figure out if the passage is right for you. Your first consideration is making sure this is a safe passage for you to undertake. This is difficult topic and I suggest you read this offshore safety post from top to bottom and implement it’s advice every time you’re evaluating any offshore opportunity. If you have any hesitation stop and think! Ask somebody you trust! Trust your gut. Trust your preparation. If still in doubt stay on the dock. Having come this far also make sure this is the kind of offshore experience you want. Are you likely to motor the whole way? Will you be on an aggressive schedule? Will you be sailing an area you want to explore? How crowded will the boat be? Make sure you stop to ask yourself if you want to participate in this passage while you’re trying to figure out if you can participate. Deliveries have given me some of my most challenging and most memorable offshore experiences; I wish you luck on finding your own deliveries where you can gain offshore experience. Keep in mind that that deliveries are very seasonal; I know I’ve fallen into the trap of looking for nearby passages during the harsh New England winter and not finding anything suitable. Look further afield or wait a few months and try again. Hopefully you can put the advice here to work for you and promptly and have a great offshore adventure! There is safety in numbers: there are a ton of opportunities out there and we’ve given you the tools to find them so you don’t have to commit to a passage that you’re not entirely comfortable with. Now that you know how and where to look you can consider a plethora of offshore passages and choose the one that’s ideal for you! !